began there. Her father encouraged her interest in nature and taught her much about the land and its inhabitants. She did well in school work only if it was something she found interesting and even left school shortly before graduation. Gene was an attractive young woman and caught the eye of an older business man when she was visiting friends. He was Charles Dorwin Porter. And the rest, as they say, is history. In responding to his letter, Gene warned Porter that she was unlike other women. She said what she thought and pretty much did as she wanted. He was agreeable and after a brief courtship they were married and had a daughter, Jeanette. Charles prospered and Gene definitely said and did what pleased her. Writing. Photography. Drawing. Mucking about in the swamps in northern Indiana. Collecting plants and birds. She became a world famous author and an avid advocate for conserving our natural resources. In her time she influenced politicians and presidents and provided reading joy to millions. She went to California to visit, but eventually went there to live. She died in an automobile crash in 1924. Indiana). Reprints of her books are currently available as are some of her movies. Books that made her famous included Freckles, The Girl of the Limberlost, and Michael O Halloran. AHEAD OF HER TIME is the title of the free Mather lecture and book signing to be presented by local author Barbara Olenyik Morrow on Sunday, November 6 at 2 pm at The History Center. conservation long before it was fashionable. Although this book is ostensibly written as part of a series of Indiana history books for youth, it is an excellent adult book as well. Gene Stratton-Porter emerges as a thoroughly believable and modern woman who was passionate about her cause. And we should all applaud her vision. I thoroughly enjoyed reading again about the author I read greedily as a child. I think I will read again the lessons she taught about goodness and clean living and loving nature. Nature can be cruel, but her books provided lessons in a kinder and gentler way of living. Olenyik Morrow has captured the essence of Stratton-Porter in her narrative. 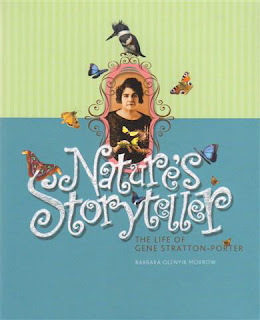 NATURES STORYTELLER; THE LIFE OF GENE STRATTON-PORTER (Indiana Historical Society Press, 978-0-87195-284-4) by Barbara Olenyik Morrow is available at the Museum Shop.